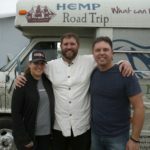 This page is a resource for members and hemp industry professionals to learn about the inner workings of the hemp farmer. If you wish to be featured here please send us a note. We are very fortunate to have had a very nonrestrictive process in the state of Minnesota. The Minnesota Department of Agriculture has followed the directive on the MN State Law and not imposed additional restrictions. They essentially are doing what was mandated in the statue and not over-regulating. They have also done this without additional staff funding. The open nature of the Minnesota Pilot program is going to help foster innovation and investment by early Industrial Hemp pioneers within the state. Q: You are one of 6 farmers in the state able to grow for research and development. how has the testing and process with the state been? A: I believe there were 6 pilot growers in the the state this year totaling 25 acres. Of that we had 18. It’s all relative, but currently (for this first season) we are the “big fish” but I am humble because the pond is definitely tiny. Next year we hope to continue to be a leader in acreage but we are cautious to not get too ahead of ourselves and over supply the market. Nothing could be worse than to over grow to the point where it ruins the economics of it for the farmer and in-turn creates a negative narrative in the Agriculture community. The testing process was very simple and the department of agriculture did it and as a courtesy provided us with the detailed data results. I really can’t say enough about how smooth it was working with the Minnesota Department of Ag. We are a large Agriculture state and all of the Industry excitement aside, just another crop Minnesota Ag professionals want to grow well. Q: Why did you want to grow hemp and what advice do you have for future hemp farmers? A: That is an easy one. I was not in any way a Hemp crusader or Ideologue more simply and entrepreneur. I’ve been waiting for the right idea at the right time in my life and this is it. I think we can grow hemp successfully in Minnesota but more importantly I think i can overcome the logistics hurdles of processing and overall supply chain dynamics. 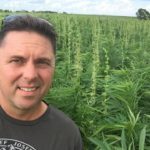 In the end I am a sales and marketing guy as much as I am a farmer, that’s what I am truly excited about…opening up the market for domestically grown Industrial Hemp. We have assembled a great team of people to help make this happen and so far we are on track to have our current 2016 crop available to consumers within the next month. Q: What advice do you have for future hemp farmers? A: Do your homework, talk to others and learn from the mistakes they have made but unleash the innovation inside yourself. Don’t fall into the trap of conventional farming that “this is the way you have to do it..”. Finally, be very cautious and listen to your instincts. There will not be “trainloads” of Hemp grain traversing the Minnesota countryside in 2017. This is a new industry in the United States. Like all industries it is filled with good folks and bad folks (and many in between). There are a few people setting unrealistic expectations for the farmer and the consumer. We need to self govern and not over play the opportunities that are opening up. It will be a good ride for everyone in the industry if we don’t allow ourselves to mess it up. It’s also ok to be competitive but more critical is to be collaborative. There are many ways to compete and also help grow the industry together. Q: What are some of the biggest issues you see and how to resolve them? A: Like most I will mention the legal point. Getting the DEA out of the mix of Industrial Hemp is critical. We know it will happen just a matter of when. I hope it is soon but honestly I am pleased to be able to have this first year within the Pilot status to get our plan together. Once things open up, large investments will be made and small players will get overrun. It is critical to have your plan in place before that happens. The plan will change and the openness will create opportunities but I want to be well prepared and positioned for those to select the right ones to align with but also have good competition threat defense plans. Processing is a big handicap to having a reliable market so we are focused on resolving that for ourselves and other growers within the state. One easy next step would be to have good Leadership within each Pilot state and establish reciprocity agreements. This would essentially be having multiple states join together and agree that for example Minnesota Hemp can be processed in North Dakota which is another pilot state. Most educated folks are fully aware that viable grain is traversing state borders in violation of Federal law. It would be nice additional pressure to have states take action and specifically agree (with each other) that neighboring state grain is “welcome”. It won’t change the Federal law over night but it would be another chink in the armor. The over supply issue I mentioned earlier is really something that I am thinking about a lot. I have read comments from others in the Industry that I agree with fully. We need to increase awareness and create new demand for Hemp products. Farmers can grow to that demand but it doesn’t do anyone much good to grow 10,000 acres in Minnesota if we only need 1,000 to supply the current market. So while I get excited to say “Let’s Grow!” I want to put the”….but not too much too fast” right after it.